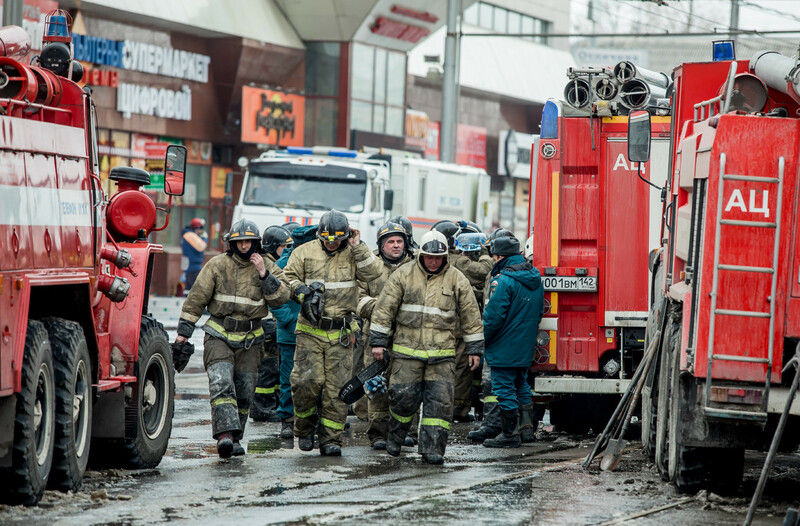 Many people, including children, died in a fire which broke out in a shopping mall in the Siberian city of Kemerovo on March 25. It’s still unclear what caused the tragedy but the local authorities are being blamed for not providing fire safety in the building. 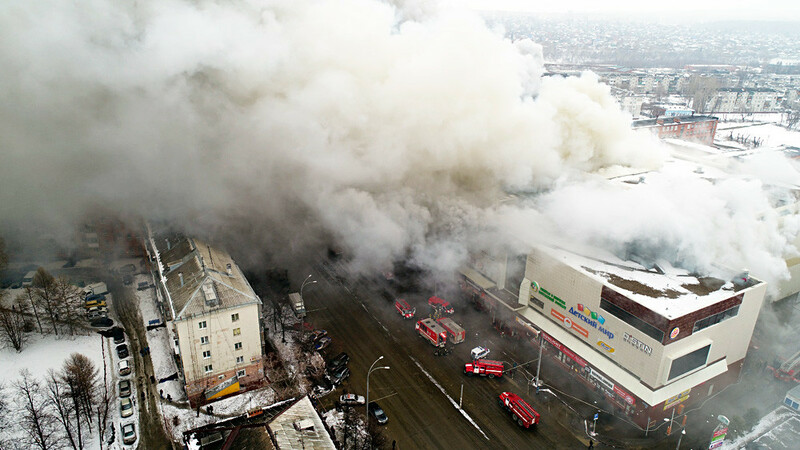 Kemerovo, an industrial city in Siberia – 3600 km east of Moscow – witnessed a deadly blaze on March 25: The four-story Zimnyaa Visnnya (Winter Cherry) mall caught fire, which is thought to have started in the kid’s zone next to the cinemas. As eyewitnesses report, the fire alarm failed so many people were trapped inside the burning building. Smoke rises above a multi-story shopping center in the Siberian city of Kemerovo on March 25, 2018. By 14:00 the next day the mall was still partly on fire – 230 firefighters were struggling to put it out for more than 24 hours. The Russian Ministry of Emergency said 64 people were dead, including children; many classes visited the mall on Sunday to celebrate the start of Russia’s spring. About 200 animals in the petting zoo on the third floor died as well. What led to the catastrophe? It remains unclear: There are suggestions that a child may have accidentally started the fire, and faulty wiring has also not been ruled out. In any case, eyewitnesses report that no help arrived immediately after the blaze started. “No sound from the fire alarm, nothing. Even the evacuation doors on the first floor were closed. I still don’t understand how we managed to escape the fire trap,” Dmitry Khoroshavtsev, who was inside the building, told KP. A group of firefighters walk near the scene of the shopping center after a fire on March 26, 2018. Anton Gorelkin, a Russian MP from the Kemerovo Region, wrote on Facebook: “The systems of fire alarm and firefighting [in the building] failed completely. When the fire just started there wasn’t even an extinguisher nearby. One working extinguisher in the right place could have prevented all this.” Gorelkin says the mall had obvious problems with security systems and the fact that local officials signed all the documents allowing it to be open to the public may point to corruption. “We have some more shopping malls in Kemerovo built exactly the same way: Cheap plastic, labyrinths of corridors, and dubious property documents. They all should be checked and if there is any tiny violation, close them to hell. There is no corrupt money that’s worth children’s lives,” Gorelkin went on. Vice governor of the region Vladimir Chernov stated that the authorities have many questions for the owners of the mall. On March 26 the Russian Investigative Committee officials stated that the fire alarm was turned off by one of the guards – after the fire had already started. 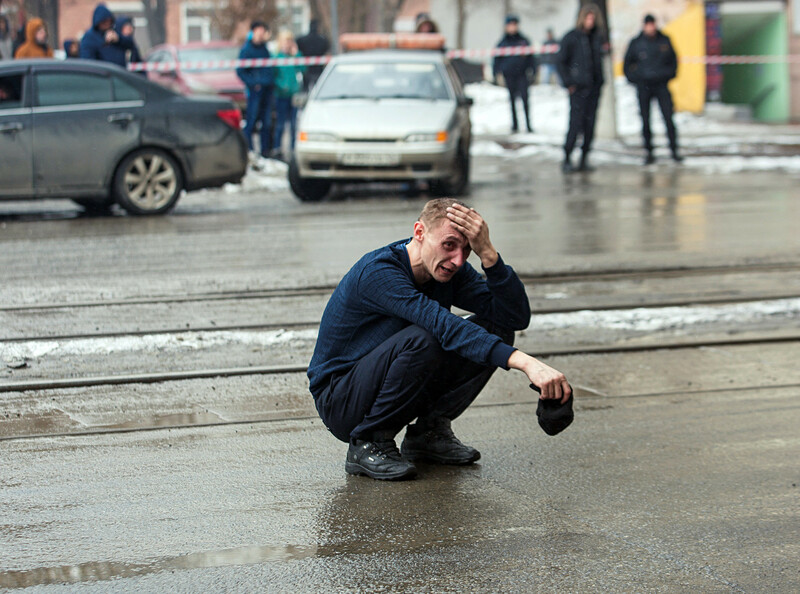 A man reacts at the scene of a fire. Picture taken on March 25, 2018. 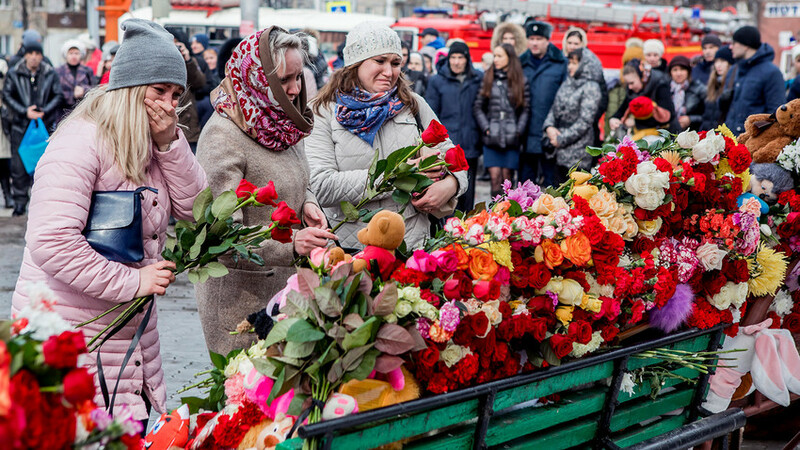 The administration of the Kemerovo Region declared three days of mourning on March 26 but Russians and people from all around the world were already expressing their shock and condolences. “Sunday in a big city, a shopping mall where children play – it’s all so recognizable, so close to everyone… I’m crying and hugging my children,” Galina Yuzefovich, a literary critic, wrote on Facebook. “Those who had something to do with blocked evacuation exits should be punished…This is a horrible lesson,” Vasily Konov, a journalist, wrote on Twitter. Flowers, candles and toys outside the Zimnyaya Vishnya shopping center where at least 64 people died in the fire. People in Moscow are bringing flowers and children’s toys to the office of the Kemerovo Region. In Kemerovo, there were long lines outside blood transfusion stations – in the morning following the fire, after just two hours doctors told people they already had enough blood. 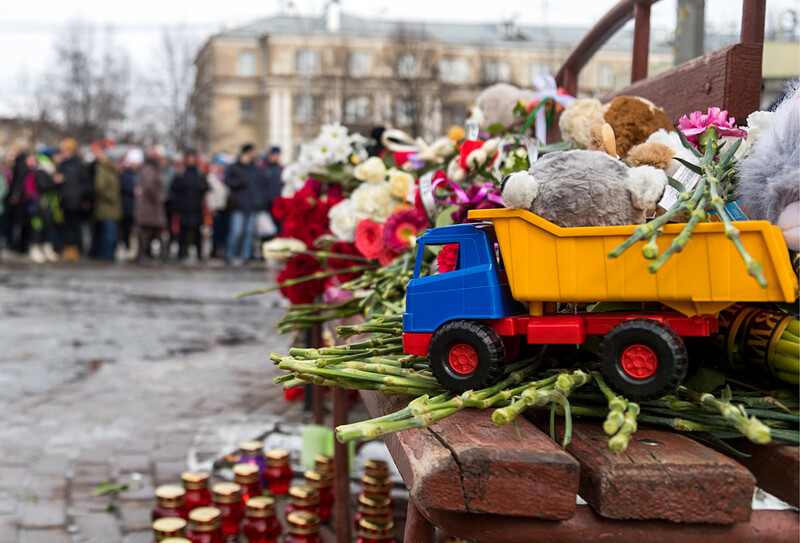 UPDATE: The latest official reports as of March 27 put the death toll at 64, among them 41 children, with a further 68 people hospitalized.President Vladimir Putin has declared March 28 a national day of mourning. If you want to help the survivors and people who lost their families, there is a donation form on the Russian Red Cross Society (Kemerovo regional department) web-page where you can donate money (available in Russian).